In a mass opposition rally on the first anniversary of President Vladimir Putin’s return to the Kremlin, protestors demanded that the Bolotnaya Square case against 27 political activists to be dropped. Moscow saw this year’s biggest protest rally on Monday evening as about 20,000 people turned up to Bolotnaya Square across the river from the Kremlin, calling for the prosecution of 27 anti-government protesters to be dropped. Leading opposition figures addressed the crowds in a largely peaceful rally where only a handful of protesters were arrested for public order offenses. The speakers stood on an improvised platform after a volunteer was killed in an accident earlier in the day, when equipment fell on him as he and others were assembling the stage. Sixteen out of the 27 demonstrators have been jailed over the past year on charges of either inciting violence or attacking the police during a previous mass protest, also at Bolotnaya Square exactly one year ago, ended in violent clashes with police and several hundred people being detained. 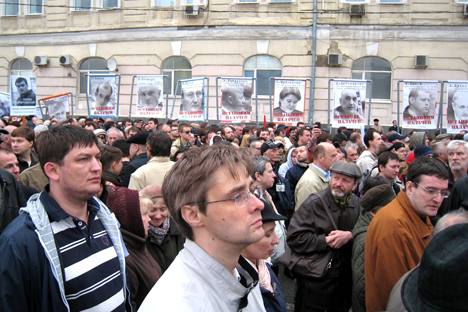 The May 6, 2012, protest came on the eve of President Putin’s inauguration. Putin was elected for a third term in office in March 2012 with 64 percent of the vote after a contest that was marked by the country’s biggest anti-government protests in the past 20 years. Since Putin’s inauguration the street protests have lost steam, however, with the turnout for rallies dropping from over 100,000 at the height of the election campaign to well under 30,000 people. Government officials have denied that the 27 protesters are being politically persecuted, and say that a series of tougher public order measures enacted since last year’s protests are necessary to prevent a repetition of the May 2012 riots. On Monday evening, President Putin was in the Kremlin during the protest and was aware of it, his spokesman Dmitry Peskov said. On Bolotnaya, participants in Monday’s rally were confident that the protest movement would continue. Moscow police estimated attendance at the rally at 8,000, while a group of opposition monitors calculated the figure at 27,500. Guseva came to the rally with her son, Anton, a student at Moscow State University, who volunteered to raise money along with fellow members of the May 6 Committee, a group of activists who organize public campaigns to support the 27 protesters either jailed or facing prosecution. “This cash will be used to pay the lawyers and buy essentials for the May 6 prisoners,” Anton Gusev said, adding that donations were up to 1,000 rubles ($30) each. While the crowd unequivocally backed the main demand put forward by the organizers, which was to set “political prisoners” free, many had come along primarily to protest against the government, which they claimed was illegitimate. “All the three branches [of government] are controlled from one center,” said Olga Khomskaya, a language teacher, who held up a poster showing a picture of an octopus, with its tentacles inscribed with the words “State Duma,” “courts” and “Channel One,” among other institutions. Some of the protesters said they doubted street rallies alone could bring real change to Russian politics. “The protest movement should evolve into a fully-fledged civil society, and that’s possible only if we seek broader self-government and grassroots control of the [federal] government through referendums,” said Vitta Vladimirova, a lawyer. Organizers had considered calling off the rally Monday afternoon after a volunteer was killed on the square as a loudspeaker that he was mounting on the stage fell on top of him. The incident sparked a quick debate on social networks as to whether it would be ethical to rally on the site where someone had died tragically a few hours before. The organizers decided to go ahead with the rally, starting it with a minute’s silence. Speakers had to use a flatbed truck as a podium instead. Out of around a dozen speakers the crowd cheered anti-corruption campaigner Alexey Navalny, one of Putin’s fiercest critics, the loudest. “A year ago, I had zero cases brought against me, now I’ve got four or six, but I don’t care – I’ll keep saying what I want and what I think,” Navalny told the crowd through a bullhorn. Navalny, who last month declared his intention to run for the presidency in 2018, is being charged with fraud and embezzlement of funds in five separate cases, which may shut him out of elective offices forever. In one of the cases, which went before a court in the Kirov region last month, Navalny faces to up to 10 years in prison. Several leading experts, including Putin’s long-time ally, former Finance Minister Alexei Kudrin, have publicly supported Navalny, describing the charges against him as politically motivated and trumped up. Best-selling author Boris Akunin, another leading opposition figure, warned “famous people with a good reputation” against “collaborating with the police state,” in an apparent reference to celebrities who had campaigned for Putin during the presidential elections.